TOPEKA – Mating season and the quest for more secure habitat have deer on the move this time of year, increasing the chances of vehicle collisions. Typically, the greatest number of deer-vehicle crashes are in mid-November when the rut, or mating season, peaks. In addition to the rut, deer are also on the move in mid-fall seeking new food sources and shelter as crops are harvested and leaves fall from trees and shrubs, leaving them less secure than in their summer habitats. According to the Kansas Department of Transportation, 10,226 (17 percent) of the 58,834 vehicle crashes reported in 2017 were deer-related (crashes in which a deer and vehicle actually collided or the presence of a deer was a contributing circumstance). Crashes involving deer occur in every part of the state throughout the year. In 2017, Butler County had 438 vehicle-deer crashes, the most of any county, while Sedgwick County followed with 385 vehicle-deer crashes. 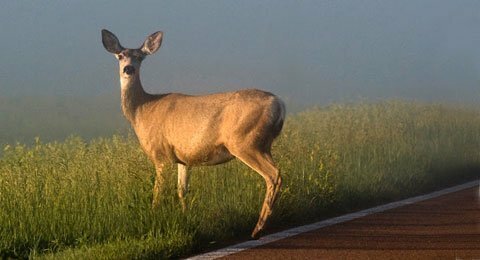 A spokesman for the Kansas Highway Patrol cautions drivers to refrain from making exaggerated maneuvers to avoid a deer in the road, which can make the situation worse. Be especially watchful at dawn and dusk when deer are most active. If you see one deer, watch for others, as they seldom travel alone. Reduce speed and be alert near wooded areas or green spaces such as parks and golf courses, and near water sources such as streams and ponds. Deer crossing signs are placed in areas where high numbers of vehicle/deer crashes have occurred in the past; heed them. Use bright lights when there is no oncoming traffic and scan the road ahead of you for movement or the reflective eyes of deer. Don’t swerve to avoid hitting a deer – the most serious crashes occur when motorists swerve and collide with another vehicle or run off the road and hit an obstacle. Always wear a seat belt and use the appropriately-fitted child safety seats – they are your best defense should you be involved in a crash. A long blast on your horn may frighten deer away from your vehicle. The Insurance Information Institute advises against relying on devices such as deer whistles and reflectors, which have not been proven to reduce collisions with animals. Slow down, move your vehicle to the shoulder if possible, and call for law enforcement. KHP dispatch can be reached at *47, Kansas Turnpike at *KTA, and local law enforcement at 911. Make sure you tell the dispatcher if the animal or your vehicle is still in the road. Do not attempt to remove the animal from the roadway; wait for law enforcement to arrive. Don’t go near a wounded animal. A frightened and wounded animal can be unpredictable. Turn on your hazard lights and remain buckled up inside your vehicle. You are more protected this way, should a secondary crash occur. If you must be outside your vehicle, make sure you are as far off the road as possible, and do not stand between two vehicles. Keep children buckled, and in car seats in the vehicle. Be vigilant and watch traffic. Anyone involved in a vehicle-deer crash resulting in personal injury or property damage that totals $1,000 or more is required to immediately report the crash to the nearest law enforcement agency. Failure to report any traffic crash is a misdemeanor and may result in suspension of driving privileges. A salvage tag is required to possess a deer carcass or remove any part of the carcass from the crash site. Tags can be issued by KHP troopers, sheriff’s deputies, or KDWPT game wardens.